California DCFS employee forced to take deposition,insofar as a father who lost his right to his child for 10 months. The child, during such time,as a result,was placed in a foster home. Mom did not raise the kids,the father did. >Social Worker in California lied prior citing,"Dad didn't work and is a drug addict. Dad never was accused of drugs ever,and able to prove,such was a falsity. -Social worker will have to expound insofar as why such dcfs vile employee also called his job and informed the boss he is a bad dad,and he has seriously injured the child,since child was five. Dad called fifteen attorneys nationwide,and in california.Not one cared about him enough to sue by his deadline approaching, yet "agreed"he suffered a violation. ​A #realchampion AND a person who is "truly innocent"will file their suit in a timely fashion pro-se to hold DCFS accountable. "We, at the E-STAFF WON network, commend such loving father,falsely accused." 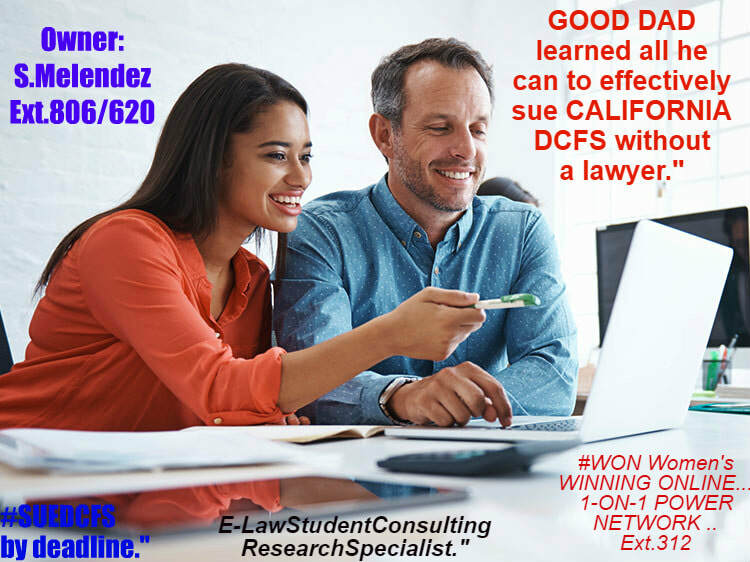 The founder, our amazing e-staff boss, MS.S.MELENDEZ won her right to see her $50 Million,in damages against abhorrent workers at DCF move forward, without any lawyer, and she knew to file it pro-se,without any further delay..."Media validated such relevant winning decision,hence, holding ALL @ CPS accountable,while she learned and applied at California, and east coast law schools,doing better with such lawsuit than any lawyer could have and she did not allow for attorneys to lie,mislead her,insofar as her redress available,and executed it correctly and the "right way..."She now teach/EMPOWER,EDUCATE 24hrs.a day,those who are still violated,who are suing as she astutely prudently has effectively, successfully done,to ensure others harmed/violated,do not end up missing deadline to sue,the nation's worse agency in the world,as experts coast-to-coast agree,"when sued...Such violation as for the owner,shall cease." All up to you. No 1 else...Good luck to all ... 1-929-277-7848 Help form on popular fb page or click here.